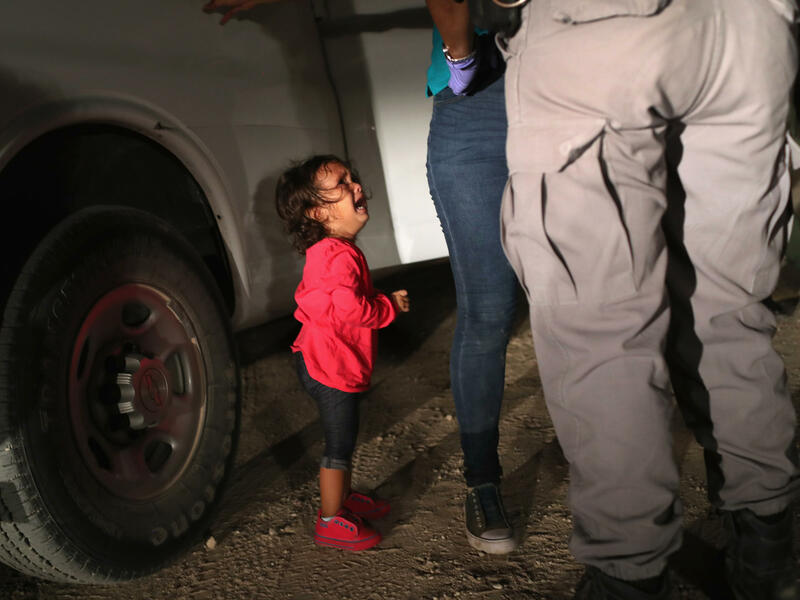 A 2-year-old Honduran girl cries as her mother, who seeks asylum, is detained at the Southern border near McAllen, Texas, in June. As the number of migrant children detained by the U.S. government grows to almost 2,000 minors, Trump administration officials defended the policy of separating children from their parents and authorities announced plans to house several hundred juveniles in a temporary tent shelter near El Paso, Texas. The Department of Health and Human Services has selected Tornillo Land Port of Entry as a temporary shelter location for unaccompanied minors cared for by the department's Administration for Children and Families, according to department spokesman Kenneth Wolfe. "HHS is legally required to provide care and shelter for unaccompanied alien children referred by DHS, and works in close coordination with DHS on the security and safety of the children and community," Wolfe said in an email. "This effort has no impact on the ability of DHS to conduct its primary mission." The announcement came as the Trump administration has taken into custody 1,995 children after separating them from their parents in the six-week period from April 19 through May 31, according to a spokesman for the Department of Homeland Security. The shelter site at the Tornillo Land Port of Entry will consist of heavy-duty canvas tents, which will be air-conditioned. Officials with Customs and Border Protection told NPR-affiliate station KQED's John Sepulvado that the facility can accommodate 450 beds. Children held in custody by the health department's Office of Refugee Resettlement are spread out in a network of federally licensed facilities. NPR reporter John Burnett visited one such shelter in Brownsville, Texas, this week. The administration's family separation policy has been criticized by lawmakers from both parties, including House Speaker Paul Ryan and Minority Leader Nancy Pelosi, as well as religious leaders and pediatricians. But in a conference call with reporters Friday afternoon, administration officials with DHS and the Department of Justice defended the policy as a means of implementing the policy of "100 percent prosecution" of illegal border crossers. One DHS official said the past practice of releasing parents who illegally crossed the border pending a court hearing only created incentives to break the law. "Either we choose to enforce the law, or we choose to ignore it, and this administration has made it clear we're not going to ignore the law any longer," the official said.